The Russian archives are an invaluable source of information regarding the events in 1915 labeled as the Armenian Genocide. However, the story of Armenia can only be understood if one looks at it in context of World War I. In this time, many nations rebelled and established their kingdoms. Austria-Hungary lost many territories, the Ottoman Empire lost so much territory that 50+ countries were formed out of its lands. Russia was instrumental in reshaping territories in the east as part of the Triple Entente (Russia, France, Great Britain), which Russia joined in 1907. Even before 1907, Russia has been chipping territory away from the Ottoman Empire for centuries since the 1500s. There has been 12 Russo-Ottoman wars, of which only 2 of them were won by the Ottomans over a span of 400 years. As a Russian, I cannot deny that I am proud of my nation's superiority in these battles against the Ottomans. However, as a historian, I will try not to go into details of these battles, to keep my objectivity. I will focus on Russo-Armenian relations and actions to overthrow the Ottomans from the middle east and from Europe. I will use Russian archives, to be objective on Ottoman-Armenian relations. To understand what the Armenians did and what the Ottomans did, you must understand what Russia was aiming for. Russia wanted to vital trade artery of Constantinople and the Dardanelles for centuries. The only reason the Ottomans were rich in the 16th and 17th century was because of this trade post, until different routes to Asia around Africa were discovered. Constantinople was the prize, and for centuries the Russians, not only incited rebellions in the Balkans against the Austrio-Hungary Empire and the Ottoman Empire, but also in the east, where there are Armenians. It's indeed upsetting to think that Russia was exploiting the Armenians' greed and nationalism to create their own nation, but that is indeed what they wanted, and Russia simply helped them. Russia's foreign minister Sergey Sazonov explained to the French and British, that Russia required possession of Constantinople. Before Russia invaded Turkey, Russian military officials met with many high ranking Armenian leaders (Dashnak and Hunchak leaders), and it was already apparent with the thousands of Armenians who deserted the Ottoman army with their guns to join the Russian army or the Armenian rebel armies. The Armenians promised many volunteers to guide the Russians into the Ottoman territory and many soldiers to fight. Let me make this clear for some Armenians who claim that Armenians rebelled in self-defense---that is absolutely false. The Armenians offered to help the Russians attack before any massacres or attacks by Ottomans. If you were wondering if the Armenians or Ottomans started the fight, well it was absolutely the Armenians, who were filled with nationalistic ideas of establishing their ancient homeland of Greater Armenia. In the Caucasus, where, without mentioning the 150,000 Armenians in the Imperial Russian Army, more than 40,000 of their volunteers contributed to the liberation of a portion of the Armenian vilayets, and where, under the command of their leaders, Antranik and Nazerbekoff, they, alone among the peoples of the Caucasus, offered resistance to the Turkish armies, from the beginning of the Bolshevist withdrawal right up to the signing of an armistice. This was not an insignificant rebellion, the Armenians were dedicated to their cause, and thus it was a massive rebellion throughout the Ottoman east. Let us not also forget the 8,000 Armenian volunteers in the British Army. The Armenians were prepared for revolution, and they refused to be under Muslim rule. As far as the Ottoman hatred of Armenians as some Armenians believe that such a thing actually existed, we must note that Russian Ambassador Zinovyev reported of Armenians being elected to the Ottoman parliament. two Moslem and an Armenian had just been elected to the Ottoman parliament, and that there had been no sign of hostility between the Moslems and the Armenians. The Turks, and in particular, the Turkish officers have been on very good terms with the Armenians. But the Armenians, who have been instigated against the Turks and the Moslem by their revolutionary associations, do not forge close ties to their Moslem neighbors. As you can see, the Ottomans were in fact tolerant of minorities in their millet system. Ottoman tolerance is well known by historians who have studied its extensive 700 year history. What better way to prove the extent of the Armenian rebellion than to quote from the New York Times, which was sometimes embarrassingly anti-Turkish. Therefore, I think it would be a good source to document how the Armenian armies and volunteers were devastating the Ottoman war efforts. Note that these reports are from 1914, before any alleged genocide. There haven't been any massacres of Armenians. The Armenian rebellion is not self-defense. We’re Ready to Join Russian Invaders. From this border country there have come to Petrograd further reports of armed conflicts arising from the refusal of Armenians to become Turkish conscripts and to surrender their arms. It is now rumored that the important city of Van is today besieged by Armenian guerrilla bands in great force. In Feltun the number of insurgents is said to exceed 20,000 and they are reported to have defeated all the Turkish troops sent against them, causing heavy losses to the Turks. During the invasion, the city of Van was captured, and many Muslims were massacred by the Armenians. In this context, the Ottoman leaders knew that they had to somehow stop the rebellion and Europe offered a simple standard of dealing with rebellion: relocation or deportation of the hostile populace. Due to the Bolshevik Revolution in Russia, the Russians withdrew from the invasion. The Armenian commanders and their armies were left behind to continue the war, and as Boghos Nubar expressed, they fought until the bitter end. The Ottoman leaders issued decrees to relocate Armenians in Eastern Anatolia, because of the difficulty of identifying Armenian rebels who disguise themselves as innocent Armenians during the day, and at night become fedayees (rebels). The forced relocation had many excesses, and the reason for this was disease and lack of resources of the Ottoman government. The Ottoman leaders themselves were shocked at how they couldn't handle the relocations effectively, because they couldn't control the lawless lands of the East, where bandits were attacking the Armenians. 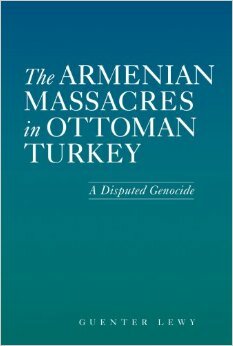 Regardless, the Ottomans did still try to pay the Armenians, shelter the Armenians, and guard the Armenians. All of which, is contradictory to the concept that an Armenian Genocide took place. The hanging of criminals and Ottomans who attacked Armenian convoys is also documented in many archives. After the Russian retreat, the Armenian armies were unable to continue their efforts. They relied heavily on aid from the British, French, and Russians. However, they were not all trained soldiers, and so in full confrontation against the Ottoman armies, they had to retreat, and they resorted to hit and run tactics. By the end of the war, the Armenians had been driven back to Yerevan, where they established their new nation. However, the Armenian armies had massacred and decimated hundreds of Ottoman villages. In addition, many Armenians fearing retribution for their own war crimes, migrated on French and British war ships and some migrated on foot toward Russia. The Armenian rebel leaders lived full lives, and many are still regarded as national heroes. In contrast, the Jews did not rebel against the Nazis in World War II. The Armenian propaganda today, declares that the Turks were at fault for genocide, but they provide no proof that there was intention to exterminate. The only thing Armenians use today to back up their claim of genocide, is to quote various anti-Turkish newspapers or the American ambassador Henry Morganthau, who was asked to create propaganda by President Woodrow Wilson to convince the American public that America must join the war against the Central Powers. If we were to believe the Armenian propaganda, which is widely spread today, then any rebellion that was put down, can be marked as genocide. The Ottomans may have been unprepared for Armenian relocations, but that doesn't make them guilty of genocide. Thank you for this great article Dr. Mihailov, it was incredibly informative. Your use of direct quotes from the archives were very convincing. The Russian archives are a gold mine of information that I want to dig into more myself in the near future. There are many stories told by Russian commanders during these times that shed a lot of light into the Armenian Genocide and Armenian-Ottoman relations. I was wondering if Armenians were ever elected into leadership positions within the Ottoman Empire or were they all treated badly. This explains it, they did sometimes have good positions within the government too. The Russian perspective is always interesting considering what kind of allies they were and still are today. Perhaps the Russians are tired of having to take care of Armenians all the time. Ironically, Armenia is filled with Russian bases even though it receives so much aid from the US. As a Russian, it pains me greatly to see that Armenians are using our military for their own purposes. Sure as part of our strategy of the Cold War, we had bases in Armenia, and did military exercises with all soviet republics. But now we owe nothing to Armenians. They owe us big time. We don't need their land for bases anymore. I think the only reason our military is there is to exert control over the Armenian government. Otherwise, even Azerbaijan is a better ally. Armenian governments (not the people) cause a lot of trouble. but The Armenian people they won't stop talking about 100 year old genocide. Like as if Russians did not die in great numbers also. I have many Armenian friends, but i am sick of hearing about genocide every april.. This is a very interesting article. Previously I had always taken what I've been told about the Armenian Genocide at face value. I knew it was quite suspicious that Turks and Armenians who've been neighbours for centuries would drop everything and engage in genocide. I feel that this was part of the British Empire's propaganda efforts in the war department to get the Americans to join World War I.
I know my country has done it's share of propaganda to win the war. I approve of winning the war, but not at the cost of other peoples' reputations and creating a century of hatred amongst two peoples. This is outrageously wrong. The Armenian Genocide DID occur, and the fault was entirely on the Turks. If you claim that the Genocide did not happen, or that it was deserved, then you are saying the Holocaust was on the fault of the Jews. Just because history has been effectively rewritten does not mean we should be imbeciles and follow that. After all, did Hitler not say himself "after all, who today remembers the genocide of the armenians"? FTA "Armenians who claim that Armenians rebelled in self-defense"
Yeah this is what they all say, Armenians rebelled because of self-defense. Yet so far it doesn't seem like that. From what I've read on the history of the area, ppl were rebelling all over the Ottoman Empire, due to nationalism. Nationalism was very strong in World War I, and a lot of nations were facing rebellion. Armenians were no different (they just refused to let the loss go). The previous article from this very site explains why the Hitler quote is false lol. Did you not even read that? No one said any genocide was deserved. There is only discussion here saying that there was no Armenian Genocide, because it DIDN'T occur. There was no intention of genocide, go read the definition of genocide and educate yourself!!!!!!!!!!!!!!!! Wheres the proof? P.S. Where i can find your article in Russian?